This week at work has been full of highs and lows. A certain analysis that my work buddy used to do with a certain infuriatingly simple tech has now become my responsibility, for better or worse. Mostly worse. Thankfully, my week was interrupted a bit, what with taking my dad to the airport and all. And then there was more snow. Because SC just can’t get enough snow in March. That really was bananas. But I had some pretty interesting dreams this week. I haven’t been getting enough sleep, but when I sleep, I’m definitely getting to REM – which is good. And the dreams have been good, too. 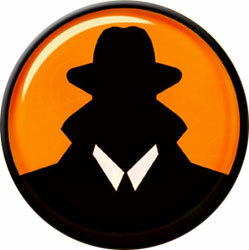 J and I are spies – like real martial arts knowing, trench coat wearing, clandestine spies. I was on a mission and ended up having a rendezvous with him to get some information before we infiltrated a huge multi-school swim meet that had undercover enemy agents posing as some of the students. We prepped for the job and went to the meet which had a pool bigger than Olympic size – enormous, really. There were hundreds of kids there ready to race and they were going to have to put several in a lane. We split up, and I went up on the bleachers to scan the crowd and meet up with another operative…who turned out to be Malik Yoba [who I had a crush on when I was like…16]. At this point I have no idea where J is – he’s in the crowd somewhere – and I don’t really care. Who knew Malik Yoba was in the agency, right? So then he leans towards me to give me an update, and whispers some stuff in my ear. And he says we’re supposed to have some type of pretense for this, so to make things look realistic, he starts kissing my neck. At this point I’m semi-aware that it’s a dream, because I’m like: “screw being a spy, lemme just make out with Malik Yoba!” So – of course – the dream ends. Well, actually, it morphs. Now I’m with some friends who have a 1 1/2 yr old girl who is my god-daughter. We’ve been kidnapped by some gangster looking dudes [not like a Mafia gangster, more like a Folk Nation gangster], and we’re in a shady neighborhood in an empty house. S has been forced to wash dishes while N holds the baby and fills the recycling bin, and I’m outside with these big dudes and they’ve got a moving truck out there and they’re making me bring small furniture in the house. I didn’t say all my dreams make sense. A couple days later, I dreamt that my sister and I were in a huge house in the woods, with a bunch of young people – little kids to young adults. The walls of the entire first floor of the house are glass, so you can see outside and look into the woods. It’s really beautiful. Also, each room with an outside wall has a door with a crash bar. I’m not sure why – but they all do. There are lots of people milling about the house, inside and out, upstairs and down. It seems as though we’re not sure why we’re there. So as my sis and I wander around looking over the place, we get back into what looks like a pretty big master bedroom. We’re admiring the scenery, when we both spot a little boy, probably about 4, cute as a button, wearing a little bear costume. It shows his face, but it’s got a lil hood that’s on his head and has the cutest lil ears…he’s adorable. 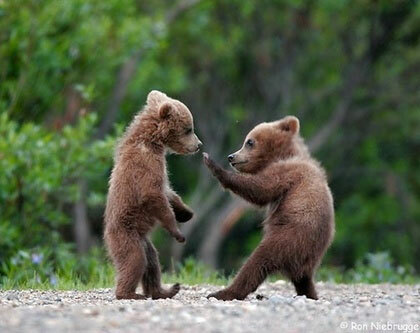 And he’s outside, pretending to be a bear, and do bear things. So he’s picked up a branch and is shaking it back and forth, trying to act all strong. Then I notice something off in the periphery – it’s a tall, kinda-skinny-for-a-bear, bear. A real bear. So I start waving my arms and trying to get the little boy to notice and get him out of there, But he’s gotten stuck under a heavier branch he was trying to move and I’m starting to freak out. But a bigger kid [also in a bear costume] runs up and gets him and runs off in the opposite direction. Meanwhile, the actual bear has seen me waving my arms and making a ruckus and is now trying to get in the house, using the door. I’m a little terrified as I’m watching him shake that door, and he keeps shaking it until it opens! This is when I grab my sister and we run from the room, slamming the door behind us, yelling that there a bear in the house. Apparently the weird dreams are contagious, because today N (from dream #2) called me to tell me she had a bizarre dream about me last night. When I first moved to Podunk, my pastor sat down across from me one week and said, “May I ask you a personal question?” I said, “Ok, I guess, ” wondering what was coming, as this guy didn’t even really know me yet. “Do you want to get married?” he asks. Huh? What? Yeah – that’s what he asked. Not for himself – he’s old and married. But anyway, I told him I wasn’t on a marriage quest, but I’m not opposed to the idea. At that time I had no idea that his son, D, is a young, unmarried, uncute pastor. [Uncute, but not ugly. Just…his face his kinda…off. Not like – he has no face. There’s just something off about it. And I have hangups about the face.] And he really wants his son to get married. A lot. Another single girl moved here, and he kept talking about how she needed to meet his son. Unfortunately for him, she ended up finding a dude on her own. Well, in N’s dream, we were in the Philippines [where she’s from] with her family, and the pastor and his family, and me. No idea why we were there. I was holding my god-daughter and talking with N, when D came up to stand next to me as we were talking. At some point, N realized that we were ‘together’. And I think she started freaking out a little inside, because this is so far from reality. So then I hand the baby back to N, and D gets down on one knee and proposes. Inexplicably, I say yes. Obvious that this was her dream, not mine. In mine, Malik Yoba was kissing my neck. That was a good dream.